Welcome to the beautiful world of Art. Since ages art has been an integral part of mankind. Whether it was Harappa and Mohenjodaro civilisation at the Indus valley or Khajuraho. From the Ajanta Ellora caves to Hampi, humans have always found art a great medium for expression. All great rulers & emperors promoted art & artisans in their kingdoms. If we talk about the modern world, today none of the establishments, whether commercial or residential can be aesthetically complete without art installations. 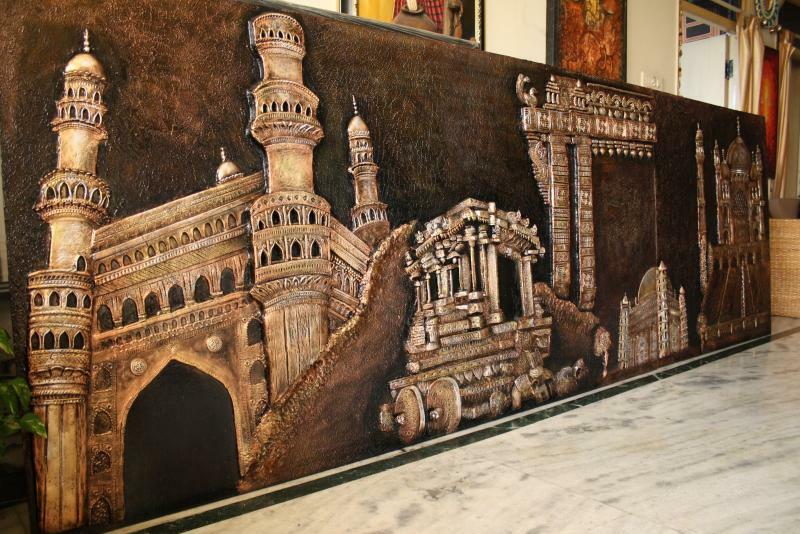 We at our Studio work with multiple mediums to create exclusive art pieces in the form of Murals, Paintings & Sculptures as per your requirement. We work with different mediums like Cement Clay, Fiber, Siporex, Metal, Stone Wood, Glass, Oil, Acrylic, Enamel, Deco Colours etc to reach the desired result. In case of local orders we prefer having a site meeting to understand your aesthetic requirement after a preliminary discussion. Then we prepare the lay out keeping in mind your preference & feasibility. Outstation cutomers can let us know their requirements through mail, whats app or phone. The art work can be created after understanding your requirements & with your approval of the layout. We arrange for shipment within and outside India.